Val Arnault-Pelletier, Aboriginal co-ordinator in the College of Medicine. There is always room for growth. 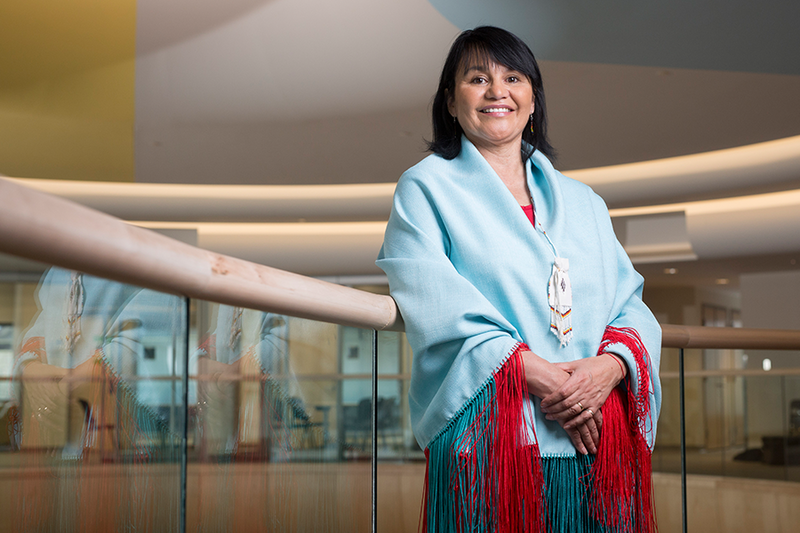 That is the takeaway Val Arnault-Pelletier stressed when talking about the strides the College of Medicine has made when it comes to its Aboriginal portfolio. "A few years ago we had three (Aboriginal) students in undergrad," she explained recently during a tour of the newly opened Gordon Oakes Red Bear Student Centre. "Today we have 31—that's a huge increase in a short amount of time. "But I think we have much more to do—I'm always looking to grow, expand, and enhance current programming and initiatives." And that is nothing less than what the college and Arnault-Pelletier expect from her work as the Aboriginal co-ordinator. Her work not only keeps her busy with community outreach in helping to draw students to the college, but she spends time meeting current students, one-on-one, to discuss their experiences, the curriculum and share feedback about where they think the college can improve. It is no coincidence that in her six years at the college she has seen not only growth in terms of the number of Aboriginal students, but an improvement in the Aboriginal and rural health curriculums. "Indigenizing our curriculum, and indigenizing our college is huge," Arnault-Pelletier explained. "But the question is how do we get there? And one of the things that I always say to different colleagues is that this isn't only a Val Arnault-Pelletier responsibility, this is the responsibility of all of us—the success of any of our students, and the success of any of our programming is all of our responsibilities. There are some great initiatives happening on campus related to indigenization at the U of S and some good partnerships we can continue to build on such as the Indigenous Voices Program at the Gwenna Moss Teaching and Learning Centre." Arnault-Pelletier said that by "working together, creating new programming and new initiatives, always checking with students and seeing what we can be doing, that's how we build a strong program." And it has not escaped the notice of the students how important her work has been in increasing the recruitment, supporting mentorship, and helping to ensure the college retains its Aboriginal medical students. "She is always looking for new ways to engage students in indigenized learning," said Jaylynn Arcand, a third-year Métis student. "She has been a support for me since the first day of medical school, and when I think of all the people who have led me to be successful as an Indigenous leader, I think of Val. "Her office has always been open to me and to my classmates for anything—from casual conversations to support during more difficult aspects of medical school." Arnault-Pelletier, whose family roots are from Beardy's and Okemasis First Nation and Waterhen First Nation, also believes that part of indigenizing the curriculum involves introducing all medical students to the needs of the Aboriginal community, both in Saskatoon and rural communities across the province. "We have Aboriginal clerkships now for any students—not just Aboriginal—to go to All Nations Healing Hospital and Dakota Whitecap First Nation," she explained. "Working on those kind of initiatives that bridge cultures and build relationships with Aboriginal and non-Aboriginal communities' off-campus, it's opening the eyes of students to that whole experience. "Continuing to build on that in our new curriculum in the subsequent years is how we can make a difference."